We just signed up for a CSA box again and I'm so excited! I've been wanting an excuse to get more adventurous with my cooking, and here it is. I've never liked cooked carrots but I thought that the munchkin might enjoy these. As usual, she completely defied my expectations and spit them right out. But I was pleasantly surprised to find that I loved them! They are like candy and I promptly ate the whole bunch for lunch today. 1. Preheat oven to 375. Line a baking sheet with foil. Trim carrots so just a bit of each stem remains, then peel with a vegetable peeler. 2. 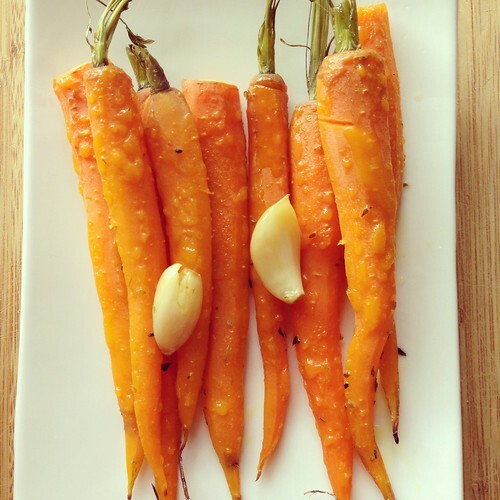 Place carrots on foil and toss with olive oil, then sprinkle with salt and pepper and place the garlic cloves on top. Make a packet with the foil and seal tightly. 3. Bake for 20 minutes. Increase oven temperature to 400 and open the packet all the way so the foil is spread out on the baking sheet. Continue roasting until desired doneness, about 15 more minutes. Reserve garlic cloves to flavor salad dressings or oils if desired.